Well, my stay-cation has been a success. Instead of going somewhere for vacation, I stayed home and spent some time doing the things that I haven’t been able to much lately, like card making. I have attached a couple of the cards that I made this week. What a joy to spend time crafting. I really need to continue to set time aside as it is such a stress reliever to play with paper, ink and glue. 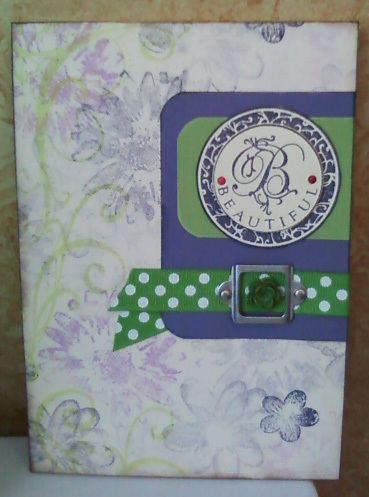 Card 1 (Beautiful): Has a hand stamped background with a raised stamped imaged along with ribbon, brads, and metal frame embellishments. 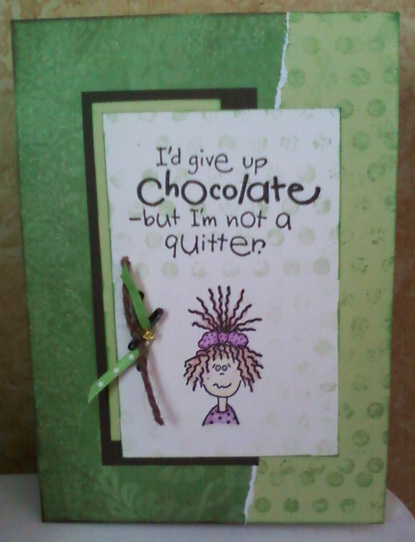 Card 2 (Chocolate): Combines a hand stamped background with pretty torn paper that enhances the stamped image of a frazzled girl. I love the Chocolate saying! It was embellished with some ribbon, twine, bead, and mini-safety pin.